In this series of blog posts, Vili Lehdonvirta writes about his thoughts and experiences at ISA 2014 in Yokohama, Japan. In this third and final part, he discusses organized labour and global production networks, and draws implications to the study of online work. Read the first and second parts. In my last post, I concluded that we must ask not only how individuals and institutions win or lose from labour market flexibilization, but also how they adapt to it. Unions are among the institutions perhaps most troubled by flexibilization. As work becomes more individualized, there are fewer common interests and shared identities on the basis of which workers could be organized. Workers may also be physically and temporally more detached from each other, especially in online work. But the need for collective action has not gone anywhere, on the contrary: the dismantling of labour standards means that there are no institutional limits to how poor wages and onerous terms individuals with little or no bargaining power can be subjected to. Indeed several sessions at ISA gave examples of just such wages and terms. In a session on migrant worker diasporas, presenters such as Janice Fine discussed the challenges that traditional unions face in adapting to the changing circumstances. One challenge is that unions are often against flexibilization as a whole, instead holding up standard regulated employment as the gold standard. Some workers, like the independent professionals studied by Guido Cavalca, express preference for flexibility, and for this reason don’t see unions as representing their interests. Other workers are nonstandards by necessity, and find themselves excluded from some traditional unions, as described by Fine. However, in this session and also another session on informal workers, presenters reported success stories of how nonstandard workers around the world have begun to organize, and engage in collective actions that differ somewhat from the ways of traditional unions. Some adaptation seems to be happening. Labour market flexibilization in industrialized societies took place over the same period of time as the liberalization of international trade, and thus also involves a significant global dimension: the restructuring of corporate value chains to reach across the globe, and the resulting new international divisions of labour. ISA sessions paid particular attention to this global dimension, with sessions devoted specifically to topics such as transnational corporate networks, migrant workers, Chinese workers in the global economy, and perspectives on development from low-income countries. Given this years theme, many presenters discussed how the international reshuffling of work alleviates some local and global inequalities, while sometimes creating significant new inequalities. For example, Ngai Pun’s paper on Foxconn’s almost totalizing control over millions of Chinese workers’ lives both during and outside working hours was familiar, but still startling. In a session on global labour movements, Michael Fichter used the concept of global production networks (GPN) to theorize transnational corporations’ value chains from a labour perspective. According to Fichter, GPNs led by transnational corporations account for 80 percent of global trade today. By focusing on global networks rather than national labour markets or individual transnational corporations as the unit of analysis, we obtain a fuller picture of labour market dynamics. GPNs drive the precarization of work across the chain, from outsourcing and offshoring to whipsawing. Moreover, GPNs undercut local national union bargaining power, because corporate decision-making happens elsewhere and is not accessible for locally negotiated response. GPNs are also constructed strategically for profit, not in accordance with traditional sectoral boundaries like unions are, further complicating collective action. In the same session, Jeremy Anderson presented an example of how one international trade union federation, ITF, is learning to grapple with GPNs. It tries to exercise “logistical power”, or identify strategic intervention points in the network, and to create “resonant places”, or internationally supported local struggles with wider resonance. Other papers in the session were of equally high quality and formed interesting complements and contrasts, making this in my opinion the most successful session of all that I attended. There was also another session with overlapping content that I missed. An elephant in the room that in my opinion remains to be fully acknowledged by most sociologists of work and labour movements is the rapidly advancing digitalization across societies and workplaces. What bearing will it have on the issues discussed above? In policy discourses, digital connectivity is often associated with a number of potential new positive developments: open access to global markets, increased opportunities for individuals, disintermediation and decreased dependency on institutions, new socially inclusive models of production, irrelevance of geography and location, ability to voice grievances, and ability to self-organize and take collective action as a crowd. If these are indeed the consequences, digitalization will be associated with massive upheaval in the world’s labour markets and production networks. While I missed most sessions dealing with digital media as such, a highly enlightening paper was presented at a session on the internationalization of knowledge workers by Michael Vicente. His paper dealt with open source software development, or more accurately, free software development. The open source model of software development is sometimes painted as an example of a new digitally enabled production model that transcends geographic boundaries and is socially inclusive, in that anyone can contribute. But according to Vicente’s analyses, open source development communities are in practice highly geographically territorial and homophilic. Leading projects studied by Vicente are embedded in a handful of elite academic institutions from which most of their contributors are drawn, and the activity is highly professionalized in the sense of excluding those not familiar with specific tools, processes, and language. How do online labour markets relate to global value networks controlled by transnational corporations? To what extent do they simply extend these existing networks, and to what extent do they offer genuinely novel means of international economic organization? How do workers assert collective power on online labour markets, or in the larger “virtual production networks” that these markets are part of? How do workers use the Internet for organizing transnationally across physical and virtual production networks? This is the end of my series of blog posts on ISA 2014. Thanks for reading, and feel free to comment. If you want to read more stuff from me, get my book Virtual Economies: Design and Analysis (MIT Press 2014, with Edward Castronova), read my latest article in The Information Society, or follow me on Twitter. 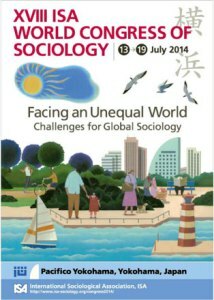 Note: This post was originally published on the OII's Connectivity, Inclusion, Inequality blog on 4 August 2014 11:00 am . It might have been updated since then in its original location. The post gives the views of the author(s), and not necessarily the position of the Oxford Internet Institute.